Gathering over 30 parliamentarians from all over Latin America in Panama City, the WTO’s regional event aimed at closing the knowledge gap of the enormous benefits TFA ratification will bring to the region and underlined the need for speedy ratification and ambitious implementation. While the Organisation of Economic Cooperation and Development (OECD) has estimated full implementation of the agreement will reduce trade cost by 16,5% for low-income countries, 17,4% for lower-middle income countries, 14,6% for upper-middle countries, 103 ratifications are still required for the TFA to enter into force. World business continues its appeal to governments to fully benefit from the potential of trade facilitation reforms by making it quicker, easier and less costly for businesses to export and import. Statistics published recently by Frontier Economics mandated by Global Express Association reveal that Latin America today actually lags behind Africa. The WTO conference identified delays in Customs clearance – Customs clearance can take up to three times longer than in countries such as Singapore – a significant barrier to Latin American competitiveness. Furthermore, countries such as Guatemala hold strong capabilities in market access yet lengthy border administration and infrastructure deficiencies persist as significant obstacles for punctual trade flows. Moreover, the National Confederation of Industry of Brazil, an ICC affiliate, recently measured the extent of compliance with the TFA in Brazil while at the same time demonstrating the Agreement’s ability to solve important national and regional problems. 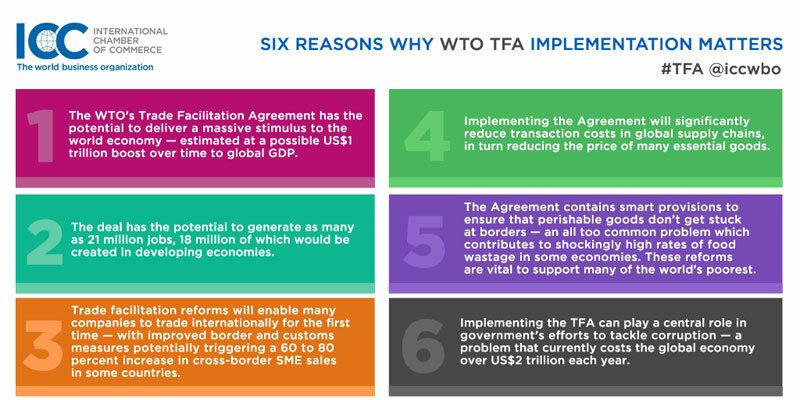 In order to fully capture the benefits of TFA provisions, ICC recommends four key points stay at the top of governments’ agendas: business engagement, ambition, speed and a coherent approach to implementation. Throughout its global advocacy efforts, ICC reiterates the need to make use of available trade facilitation tools and instruments, rather than reinventing the wheel, in order to secure a coherent implementation process and fully benefit of the potential the Agreement has to offer. Guidelines such compiled in the World Customs Organization’s Mercator Programme can play a key role to ensure the required harmonized approach to implementation.